The P type Midget was launched in March 1934 as the replacement for the J2. It is well recognised that the P type had similarities with previous Magnas and Magnettes and its parentage derived from the M and J types. 'Autocar' magazine road tested the P type in November of that year and reported "This latest model is a marked improvement in all respects over its forerunners". Sales literature produced by Abingdon claimed, "In all there are over one hundred new and improved features". With good reports in the motoring press it was no surprise that the car sold well, with serious production starting at the end of January 1934; over two hundred cars a month were coming off the production lines. The P type was fitted with an all new 847cc engine, with three main bearings supporting the rigid crankshaft. This allowed higher engine revolutions to be employed with safety. An improved Tecalemit oil lubrication and filtering system was a welcome addition to the engine. This system had two filters, one externally and the other was a gauze mesh in the sump, both of which ensured thorough filtering of the oil, thus prolonging the life of the crankshaft and cylinder bores. A "smooth flow" cylinder head with inlet ports on one side and exhaust on the other had an overhead camshaft. The transmission was strengthened and improved to withstand the increased engine power output and stresses imposed by competition work and a new design heavy duty clutch was employed to cater for the rigorous stops and starts on sprints and hill climbs. A four speed non-synchromesh gearbox with a low ratio first gear for competition purposes transferred the power to a specially strengthened back axle with a four star differential. Twelve inch diameter brake drums replaced the previously used eight inch variety. This move gave far greater braking efficiency. Hartford friction dampers were fitted to the front of the car and transversally mounted hydraulic spring compensated shock absorbers at the rear gave good suspension and a comfortable ride over most surfaces. The level of standard equipment described in the sales brochure of the time indicated that it was "all the usual equipment that sportsmen demand - supplemented by the following new extras: Easily accessible tool accommodation; non-reflecting fascia board; new revolution counter; chromium plated long range headlamps; new seat adjustment; dual arm electric windscreen wiper; stop and tail lamp; improved hood and side curtains; and new fold flat windscreen with toughened non-discolourable Triplex safety glass." The first cars produced were all two seaters and following its predecessor the J2 had its wheels painted to match the car's interior, this was soon dropped in favour of aluminium paint. P types were available in three distinctive duo-tone paint schemes, each one came with matching upholstery. Our feature car is painted in Ulster Green and Dublin Green, other options were: Oxford Blue and Cambridge Blue and Carmine Red and Saratoga Red. The most popular single colour scheme however was Black, closely followed by Green and then Red followed by Blue. Some cars were produced in primer only to allow the prospective owner to have the car painted to his choice and for an extra ten guineas the owner could specify the factory to complete the car in any colour leather or bodywork he so desired. Most of the design knowledge gained from previous involvement in production car trials and racing proved invaluable to the production of the P type. The chassis was far sturdier than the J type and the body was less angular and had more flowing lines. Two variations were available with either a two or four seater version coming direct from the factory, however a fixed head coupe was offered on the P type chassis by specialist coachbuilders such as H W Allingham of London, University Motors (who were main MG agents) and Cresta Motors of Worthing. The most popular of these conversions was undoubtedly the Airline Coupe by H W Allingham but very few of these attractive cars were produced because they were considered fairly expensive and larger standard cars could be bought for about the same price. When introduced the P type two seater sold for £220 compared to £240 for the four seater version. The Airline Coupe was offered at £290. The P type was never intended as a racing model, unlike many of its predecessors, however it was seen on the circuits and in 1935 a three car team of P types was entered in the 24 hour Le Mans race. 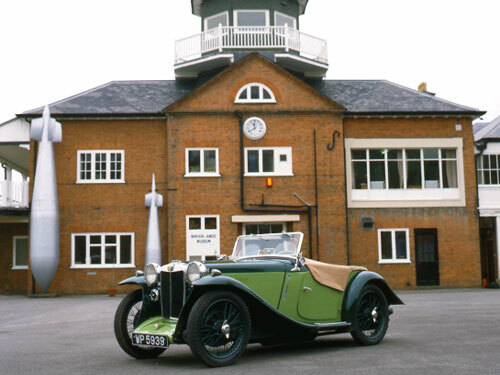 The team was managed by George Eyston and consisted of six ladies affectionately known as "The Dancing Daughters" although they attracted much publicity, they did not fair particularly well against opposition from Singer's 972cc sports car. The Singers took 1st, 3rd and 4th places. This, along with other factors prompted Abingdon to produce a more powerful model, to be designated the PB which was introduced in 1935. The engine capacity was increased to 939cc to give more power and a close ratio gearbox was fitted. Other changes included a slatted grille instead of the honeycomb type, a quick release petrol filler cap was now standard on the two seater versions. The dashboard was to feature a burr walnut fascia to replace the now banned American Sequoia redwood veneer. The rev counter was changed and a speedometer with a mileage trip meter replaced the P type's centre panel. A 30 mph warning light was also introduced at this time. The original P type was discontinued in favour of the new model although it was still catalogued at a substantially reduced price. This move failed to sell the remaining stocks and 27 P types were converted to PB models by the end of 1935. Production of the PB finally ceased in February 1936 with only 525 being produced. A total of 2,500 P types left Abingdon between 1933 and 1936.